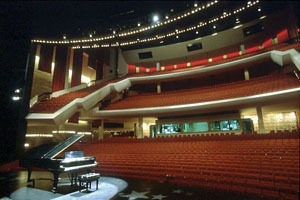 The Tennessee Performing Arts Center is the first of its kind in the nation: Owned by a state, but managed by a non-profit organization, giving Tennessee citizens the same opportunities in the performing arts and cultural heritage available to people living in major cities nationwide, introducing school children to the worlds of theater, ballet, symphony and opera, to enhance their education, inspire their imagination, and enrich their lives. Dreaming of opportunities in the arts and a well-rounded education for their children and grandchildren, a group of private citizens, led by Martha Ingram, proposed an arts center for the citizens of Tennessee to the state legislature in 1972. Funding for the arts center, built in conjunction with the James K. Polk State Office Building and the Tennessee State Museum, was approved only after a private fundraising effort established an endowment of more than $4 million. Prior to the September 1980 dedication of the Center, the state legislature created the TPAC Management Corporation to oversee the public-private partnership. This unique non-profit organization was charged with the responsibility of providing affordable performance spaces for resident artistic companies and offering educational experiences in the arts for Tennessee school children. The performance venues at TPAC are Andrew Jackson Hall (2,472 seats), James K. Polk Theater (1,075), Andrew Johnson Theater (256) and War Memorial Auditorium (1,661), the historic landmark located across 6th Avenue and the plaza from the Center. Among its many operations, TPAC presents a series of Broadway shows and special engagements, and administers a comprehensive education program. For some, TPAC is a dream come true, a source of "food for the soul." For others, TPAC is good for the economy  attracting industry, creating jobs, increasing business downtown, generating tax revenues. For one person, TPAC is a home for centuries-old cultural traditions. For another, TPAC is a place to laugh at the comedy or listen to the music. Together, artists, audiences, administrators, educators and supporters will carry the mission of TPAC into the next century. TPAC invites you to take part in the ongoing story of growth, success and service to the citizens of Tennessee.